BLOOMINGTON, MN--(Marketwired - Dec 18, 2013) - A strong work ethic has moved a teenager from Minneapolis' Phillips neighborhood up the ladder of success inside one of the premier hotels in Bloomington, MN. A student at Cristo Rey Jesuit High School, Dennis Lim, now 18, acted on the advice of his Aunt and inquired about work at the Minneapolis Airport Marriot. "My Aunt said I should apply here because everyone is very nice," said Lim. Lim applied and was hired as a dishwasher for the hotel's on-site catering service and restaurant, Bistro 79. Working to help support his mother and three brothers, Lim has always been noted by those around him as a hard worker. On a particularly busy day, he was asked to assist in the kitchen by the Minneapolis Airport restaurant's Sous Chef. 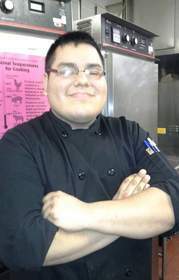 The chef recognized Lim's diligence and his potential working in the kitchen when doing whatever was asked, and that quickly resulted in Lim's promotion to prep cook and eventually line cook at the hotel, where Bistro 79 is a popular choice among airport restaurants in Bloomington, MN. "I have always been a fast learner and I don't mind working hard," said Lim who has been accepted into Augsburg College and will be attending classes at the downtown Minneapolis campus in the fall to complete an Associate of Arts degree. Students at Cristo Rey are no strangers to hard work, as the high school embraces a corporate work study program that engages students in real-world work experiences that pays for more than half of the students' cost of education. The school sets its goals on narrowing the achievement game with a rigorous college preparatory curriculum, small class sizes and quality, caring teachers. "Dennis is so smart, kind and humble," said the Marriott's Chef Thomas Hearn. "We are so proud of his accomplishments here at the hotel and also his academic achievements at Cristo Rey." Upon completion of his studies at Augsburg College, Lim's future plans are to continue his education in the physics program at the University of Minnesota. The Minneapolis Airport Marriott welcomes guests to the Twin Cities with spacious and well-furnished guest rooms, exceptional service and comfortable amenities. Conveniently located just off of I-494 for easy access to many prominent business destinations and popular attractions, the hotel offers Bloomington, MN travelers a comfortable and relaxed atmosphere, on-site dining, a full-service business center, an indoor pool and well-equipped fitness center so they can make the most of their travel time. Guests are also pampered with complimentary shuttle service to the nearby Minneapolis St. Paul International Airport and world-class shopping at the nearby Mall of America. Featuring 19,000 square feet of flexible meeting space, the hotel is an ideal choice for hosting corporate meetings, business conferences and elegant social affairs. A strong work ethic has moved a teenager from Minneapolis’ Phillips neighborhood up the ladder of success inside one of the premier hotels in Bloomington, MN.